Sweet summer baby girl Madeline came into my studio in June with big sister Mayla, and sweet mom and dad, Heather and Jason. Heather and Jason have known each other since middle school and were high school sweethearts where they grew up in northern Indiana. They were living in California, but in the middle of a move back to Indiana when they found out they were expecting Madeline. Heather said she was excited but nervous about juggling two little ones. Mayla is in love with her sister and such a sweet girl! These two are going to be the best of friends. I love the images where Mayla is looking at her sleeping sister. The family shots were so precious and Heather and Jason were so very photogenic. We had a great time. 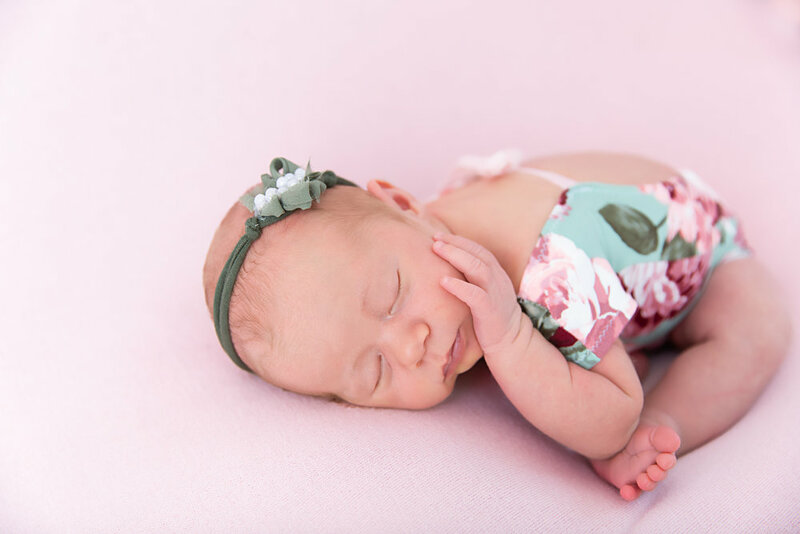 For newborn baby girl Madeline, I was really excited to use some floral prints since in June the flowers had finally bloomed after a long and cold winter! She was the perfect baby, sound asleep the whole session and let me dress her up and pose her in every prop I tried. Welcome home to Indiana to this wonderful family of four, and welcome to the world baby girl Madeline!